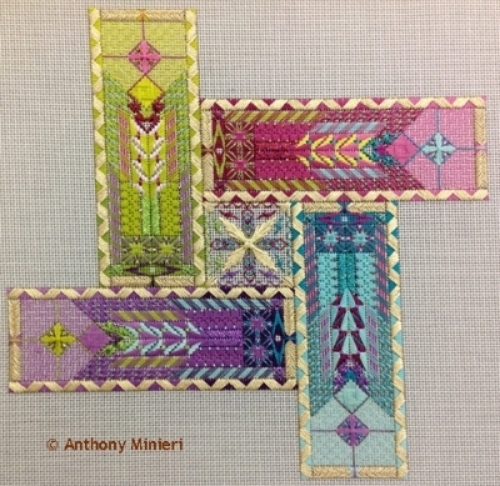 2-Day Project Classes taught by Tony Minieri. Two-day projects are original designs by Tony Minieri that are taught to a group in a classroom setting. Class lasts two full days. 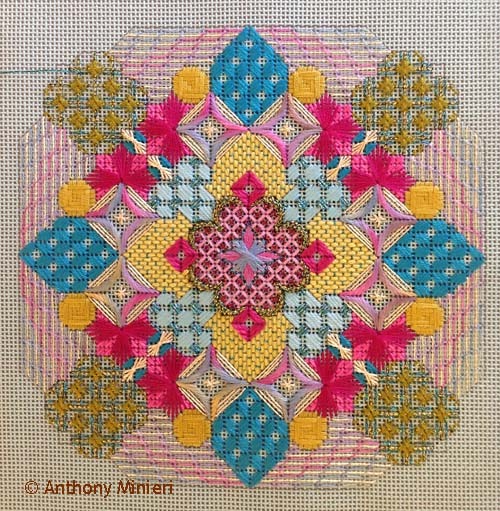 The class design is either line drawn or stitch basted, and everyone in the class stitches on the same section at the same time, with Tony providing additional instruction to supplement the written guide. These projects are typically stitched on 18-count mono canvas on stretcher bars ranging from 10" x 10" to 14" x 14", depending on the project. Original designs in this grouping include the Patch and Medallion series, the Birthday series, the Friend series, and architecturally inspired designs. Many of these designs are available in multiple colorways, and some, such as the Memphis Patch, can be stitched in all colorways on the same canvas. First in the series of needlepoint shop patches, the Memphis Patch was inspired by Amy Bunger. She asked Tony to create a Patch using the glorious colors seen in Memphis during the fall season. Tony took it one step further and created three other colorways for the other seasons of the year. Stitched on 18-count mono canvas, the background canvas is coordinated with the season's threads. When stitched as four seasons, the background canvas is ecru. 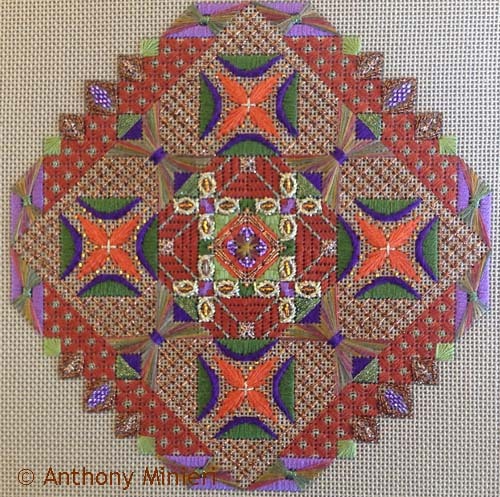 Another of Tony's geometric masterpieces, Patchouli uses an overdye that allows the colors of certain stitch elements to be mirrored or placed randomly. The repeat in the overdye can be found in the long lattice work around the edges as well as in the eight sets of crescents. Beads, metallic threads, and silks add depth and sparkle. Stitched on 18-count mono canvas measuring 12" x 12", this design's background is either aquamarine, sandstone, dusty blue, or lavender, depending on the colorway selected. Four different colorways are available. The second in the Birthday Series, La Belle Joelle is a gorgeous geometric which includes brackets, borders and heraldry. Stitches include trellis work, Jessicas and other Jean Hilton stitches. Several colorways are available and are based on the Painter series of threads. Silk and metallic threads, ribbon and beads are also used. The piece is stitched on 18-count mono canvas, and the canvas color coordinates with the colorways selected. Inspired by an 18th Century French Ribbon alphabet, this design explores couching patterns, trellis patterns, single line Bokhara couching, Bokhara couching as a filling, Jessicas, attachment of gold bullion, and creating a cartouche. All 26 letters are available in eight different color combinations: four with gold and four with silver. 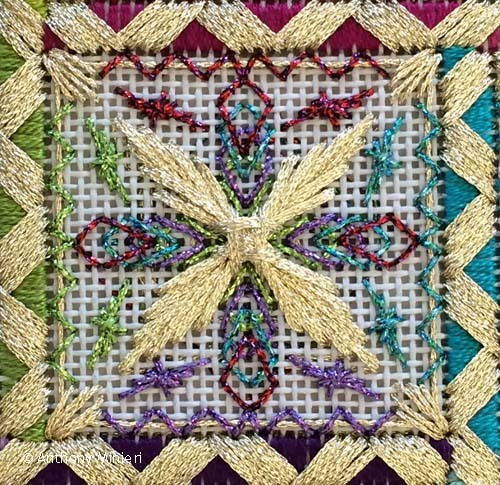 The design is worked on #24 Ecru Congress Cloth using stranded Silk, metallic braid, Soie Perlee, smooth purl and purl purl. The Dallas Medallion, designed for Creative Stitches and Gifts in Dallas, is a geometric design using stranded silk, metallic braids, Vineyard Silk Classic, overdyed stranded silk, Petite Silk Lame’ Braid, seed beads and flat backed crystals. 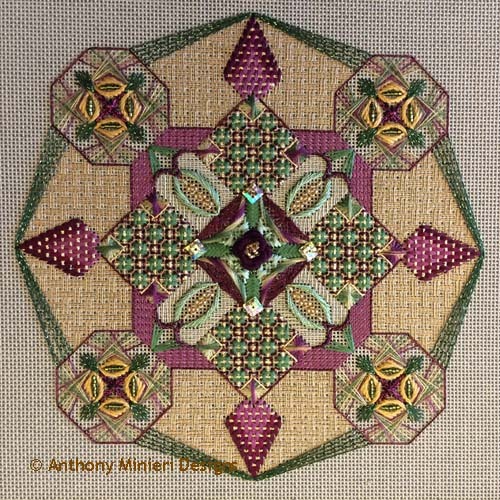 The design teaches standing bullion knots to create a 3-dimensional flower, diagonal trellis patterns, crescents, plaited rays, shaded Burden stitch, semicircular eyelets, lattice pattern, and bead and crystal attachments to name a few of the techniques. The Dallas Medallion is offered in 5 different color combinations. The Edwardian Medallion, designed for my home shop, The Edwardian Needle, is a 4-way geometric design incorporating a gold filigree medallion in the center of the design held in place by seed beads and Swarovski crystals. The design teaches composite patterns, mirror imaged partial Rhodes, crescents, couching, found object attachment and crystal and seed bead attachment. The design uses stranded silk, Overdyed stranded silk, Vineyard Silk Classic, Pepper Pot Silk, metallic braids, seed beads, Swarovski crystals and a 1” squared filigree medallion. This design, inspired by architectural details from the Taj Mahal, is a geometric etude worked in fuchsia, blue violet, acid green, and Japan gold. The design teaches complex multi-step flat patterns, crescents, Swarovski flat backed sequin attachment, bead attachment, light stitching for minimum coverage, tied sheaves, Bokhara couching, and other stitches and techniques. You will work with stranded silk, metallic braids, Petite Silk Lame’ Braid, Impressions solid, seed beads, and 10MM flat backed Swarovski square sequins. The Wright Friends is a study of window screens and stained glass windows created by Frank Lloyd Wright. Developed for a group of friends, this canvas was added to Tony's portfolio in 2014. Each window is stitched alike but with different focal thread colors. The center motif draws all four colorways together, tying all four window motifs into one.